Open Wed, Sun: noon-8 pm, Thurs, Fri, Sat: noon-9 pm, Closed Monday & Tuesday. Every Thursday is Thirsty Thursday with $5 wine-by-the-glass from 5 -close. 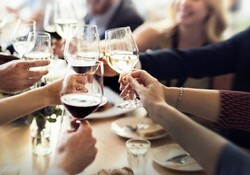 A Wine Club member celebration of past vintages. Bring a bottle of your own Lost Oak Wine to show off, share or swap with fellow Wine Club members while enjoying light fare and listing to Dave Lincoln. Select past vintages of library Lost Oak wine will be offered for sale during this event. This is a Wine Club Member Exclusive event. No charge to attend, but you must RSVP by clicking here. Cheers! Join us for $5 wine-by-the-glass* Happy Hour from 5:30-8:30 every Thursday while listening to local live music! While you are sipping wine on the patio and enjoy a gourmet cheese plate or Boar's Head products from the Tasting Room, or have a picnic on the lawn. May 30 - 1st day of Sangria with the River Trip Trio! *No additional discounts apply to the Happy Hour glass of wine special. Questions about Lost Oak Winery? See our FAQ page. It's time for our spring yoga series. Holley has been bringing yoga practices to Lost Oak Winery since 2013 and can't wait to flow into another season in the vineyard. 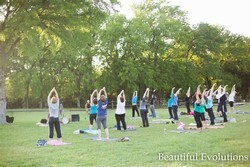 Join Holley on the grounds of Lost Oak Winery for a gentle, one hour, yoga practice. All-levels are welcome and beginners are encouraged to join. $10 cash when you arrive. Bring your own mat and a friend. Show up early or stay afterwards to get your wine on. Celebrate Cinco de Mayo Texas Style with Tacos, Texas Wine, and a good time! 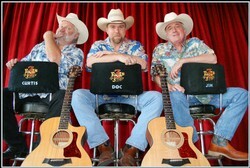 We are excited to welcome 3 Fools on 3 Stools back to the Winery for this Cinco de Mayo Texas Style concert! In a few words…a root’n, toot’n, heck of a time! The 3 Fools will delight and entertain audiences with their one-of-a-kind musical and stage show production. A show runs guests through a glorious gamut of the Fools’ superb vocal talents, remarkable guitar skills, and playful—at times, downright hilarious—banter. The spotlight shifts focus from Doc, Jim and Curtis in a round-robin fashion, as they lead the performance in a mix of classic covers, funny songs, radio-play originals and show-stopping three-part harmonies. Chicas Tacos will be serving mouth-watering taco plates, plus Lost Oak will be selling Gourmet cheeseboards and Boar's Head Products in the Tasting Room. Bring a lawn chair to relax with a glass of wine before you spend the night dancing! As always, feel free to bring your own food and drink, but please, per TABC regulations no outside alcohol. This concert is free to attend. Food and beverages sold separately. Questions about a Lost Oak Winery concert? See our FAQ page! Yappy Hour returns! 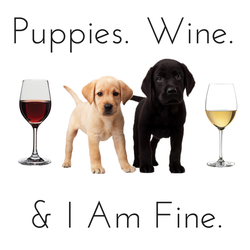 Bring your favorite furry friend to the vineyard for a special night of furry fun and live music. Burleson Animal Shelter will be here with adorable adoptables ready for a fur-ever home. Hug a pup while you listen to live music by the James G Duo. We are very excited to have Pet Supplies Plus - Fort Worth - McCart, TX at Yappy Hour. They will be selling collars, toys, bowls and a few other things. Cash only please. Oh Balls food truck in the vineyard plus Lost Oak will be selling Gourmet cheeseboards and Boar's Head Products in the Tasting Room. Bring a lawn chair to relax with a glass of wine. As always, feel free to bring your own food and drink, but please, per TABC regulations no outside alcohol. No cover charge... bring your pup or adopt your own fur-ever friend! Questions about Lost Oak Winery concerts? See our FAQ page. Treat Mom to brunch, mimosas, shopping and live music! Relax on the lawn while listening to the Simon Flory Bluegrass Band. 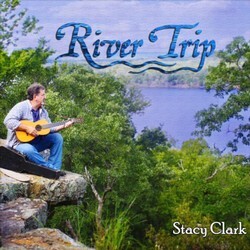 “Best Folk/Americana Act” nominee 2019 Central Track Music Honors. Enjoy a mimosa with an assortment of brunch foods from G's Brunch Truck, Doughnut Snob and Carter’s Coffee Co.
An afternoon of fun, food and wine at Lost Oak Winery! 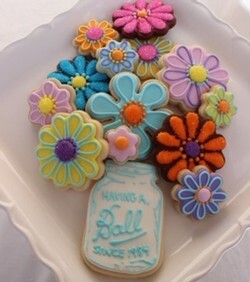 Bring a blanet or chairs, and spend the afternoon with mom and us! Get your jeans and skirts, pull on your cowboy boots and shine up those belt buckles if you got ‘em, because it’s time to go two-stepping at Lost Oak Winery with the Chasing Texas Band! Chasing Texas describes themselves as a little Haggard & Straight mixed with a touch of Waylon and glazed heavily with some Stevie Ray. We describe them as a good time and a great show! We will have a food truck in the vineyard, plus Lost Oak will be selling Gourmet cheeseboards and Boar's Head Products in the Tasting Room. Bring a lawn chair to relax with a glass of wine before you spend the night dancing! As always, feel free to bring your own food and drink, but please, per TABC regulations no outside alcohol. Free for everyone to attend! Questions about a Lost Oak Winery concert? See our FAQ page! Get your tickets from Ephemera by clicking here. Come spend Memorial Day with us. 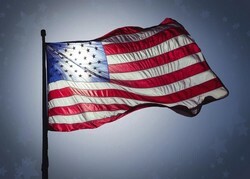 Military Service Members, we thank you for your sacrifice to our country. Happy hour price $5 wine by the glass all day. Plus, all Military Service Members, both Active Duty and Veterans take an additional 10% off any Lost Oak bottles of wine purchased on Memorial Day. Normally we give a 10% Military discount, but today your discount is 20%! Wine Club Members who are Military take an additional 10% off your Wine Club Membership discount today. We appreciate our Military Service Men and Women! Live music by Phoenix Rose from 2-5 pm. Food Truck in the vineyard, plus Lost Oak will be selling Gourmet cheeseboards and Boar's Head Products in the Tasting Room. Bring a lawn chair to relax with a glass of wine before you spend the night dancing! As always, feel free to bring your own food and drink, but please, per TABC regulations no outside alcohol. 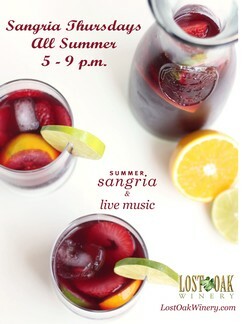 We are making Thirsty Thursdays even sweeter by adding delicious Sangria and complimentary chips & salsa from Frescos! While you are sipping delicious sangria or Lost Oak wine and enjoying a gourmet cheese spread or Boar's Head products from the Tasting Room, listen to live music from 5:30 - 8:30 by a variety of local artists. No cover charge. No reservation needed. Feel free to bring your own food and drink, or purchase from the Tasting room, but please, per TABC regulations no outside alcohol. The Thirsty Thursday Happy Hour specials: $5 wine* and sangria by the glass, or whole carafe of Sangria for $14.95. Happy Hour from 5:00-8:30 pm every Thursday. *No additional discounts apply to the Happy Hour wine-by-the-glass special. Here's the lineup - stay tuned for more! Questions about Lost Oak Winery? See our FAQ page. Dance the night away to your favorite 80’s hits with DJ Aaron & Arbutus Entertainment! Come as your favorite 80’s pop star or dress in your favorite 80’s attire. You know you have those neon shorts, legwarmers, jean jackets and jelly bracelets tucked away in the back of your closet…. Ladies, don’t forget to use ALL the hairspray and scrunchies! To sweeten the night, we will have random 80’s trivia and an epic 80’s dance off! Best dressed, best dancer and trivia winners get braggin’ rights and a prize from Lost Oak. Food truck in the vineyard, plus Lost Oak will be selling Gourmet cheeseboards and Boar's Head Products in the Tasting Room. Bring a lawn chair to relax with a glass of wine before you spend the night dancing! As always, feel free to bring your own food and drink, but please, per TABC regulations no outside alcohol. It’s like – going to be sooo rad – no cover charge – so come “sprinkler, cabbage patch, robot, pendulum, Carlton” or whatever your booty all night! Questions about a Lost Oak Winery concert? See our FAQ page!